“This book is a collection of stories from Mr. Ondar’s life, compiled by his good friend Tuvan ethnomusicologist Dr. Valentina Suzukei.” (Quote from Aksai Bapa). This book is an interesting look into life in Tuva, a small province of Russia. It is located just north of Mongolia, in central Asia. You get to follow the life of Kongar-ool from early childhood until his death at the age of 51 in 2013. You learn of the tough times he had as a youth, how he was imprisoned for a crime he didn’t commit, and how he was elected to the Tuvan Parliament, the Great Khural. During all of these events, he was becoming a well-known throat singer (khoomei). He went on to tour worldwide and he also recorded a few albums. I was able to go on iTunes and purchase one of them, “Back Tuva Future”. I listened to it as I read this book. Most of the book was about the life of Kongar-ool, but the author also let you know that Tuvan culture was in danger of being trampled down by the central Russian bureaucrats. 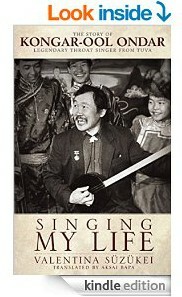 You got the feeling that this book was more than just a life-story of one of the most famous throat singers, it was also trying to bring the Tuvan culture to the forefront. He doesn’t want the world to forget, to allow their folk music to be obliterated by the cultural committees in Moscow. And after listening to the music and watching the videos on YouTube, I agree. This should not be allowed to happen. Singing My Life is a collection of stories, originally written in Russian, and then translated to English, and published this August as a Kindle e-book. There are many photographs, which really add to the completeness of the book. This will teach you about the phenomenon of throat-singing, how it is done, who does it, and why it is important that it is preserved, but unless you continue on and listen to the music and view the performances, you will be missing most of the story. Once you see Kongar-ool Ondar on stage, you will understand why this book had to be written. I think this is an important book. If you want a more complete sense of our planet, and what music can do to bring us all together, you should read this book. I give this book 4 Stars out of 5, it has some faults, but I encourage you to read it. You need to broaden your view of the world, and I think you will like it. Valentina Süzükei takes readers on a journey through the life of legendary throat singer Kongar-ool Ondar. When he came onto the scene in 1989, Ondar was one of the pioneers of Tuvan throat singing in the West. Süzükei tells stories of his childhood, his first travels abroad, his collaborations with Frank Zappa, and his work on the Genghis Blues motion picture. This book was given to me by the translator, Aksai Bapa, with the knowledge that I would give it an unbiased review. Mr. Hunter has written a very complete book about one of the most iconic electric guitars ever made. He tells the complete history, explains many of the factors that have made a classic Les Paul such a prized electric guitar. He has short glimpses into the guitar players who have played Les Pauls in their careers. He includes lots of pictures. In fact the pictures rival the text, they tell such a complete story of the artists and their axes. He also includes album covers of the major works in which the artist used his Les Paul. He shows pictures of the custom Les Paul models that Gibson has issued honoring the guitarists that are famous for playing Les Paul guitars. Mr. Hunter has included some technical details that will be very interesting to guitar players who would like customize their guitars. He talks about pickups, bridges, and various other technical details. He explains how different models of Les Pauls were built, what wood was used, and how they contributed to the sound and playability of the different models. He also has some blueprints and wiring diagrams that were used to build the early Les Pauls. I give this book 5 Stars out of 5 and 2 Big Thumbs Up! I really enjoyed this book and think that anybody that ever wondered about the mystique of this popular guitar will enjoy it too. I received this Digital Review Copy for free from edelweiss.com. The Gibson Les Paul is possibly the electric guitar most associated with rock ‘n’ roll. The result of a collaboration between Gibson’s Ted McCarty and jazz guitarist Les Paul in response to the success of Fender’s Telecaster, the Les Paul has gone on to become a prized instrument played by most of the greatest guitarists in rock history. This massive illustrated history of the guitar examines its prehistory and origins as well as its evolution in the 60-plus years since its 1952 introduction. In addition to the Standards and Customs that guitarists admire so much, author Dave Hunter also gives ample coverage to variations like Les Paul Juniors, Melody Makers, and SGs. To bring the music to life, there are profiles of players well known for using Les Pauls through the years, including Hubert Sumlin, Carl Perkins, Eric Clapton, Mike Bloomfield, Peter Green, Paul Kossoff, Jimmy Page, Neil Young, Peter Frampton, Keith Richards, Bill F Gibbons, Bob Marley, Mick Ronson, Steve Jones, Johnny Thunders, Angus Young, and more. Illustrated throughout with studio photography of the guitars, candid and performance photography of the artists, and relevant memorabilia, this book is prefect for music lovers and guitar enthusiasts. Dave Hunter is an author, musician, and journalist. He is the author of several popular books about guitars, amps, and effects, including Voyageur Press’s Star Guitars, The Fender Stratocaster, The Gibson Les Paul, and 365 Guitars, Amps & Effects You Must Play. A regular contributor to Guitar Player and Vintage Guitar magazines, he resides in Portsmouth, New Hampshire. I have listened to Bob Dylan’s music since I was in high school in the mid sixties. Mr. McDougal’s biography allowed me to learn a bit more about the stories, legends, and lies that have circulated over the past fifty years of Dylan’s public life. When I read a biography of a musician, I like to listen to their music as I read their story. Dylan: The Biography let me read and listen in an orderly fashion. Sometimes I had to stop reading and just sit there and listen to one of my favorite Dylan albums. But sometimes the album was so weak that I just skipped it. Many of his lesser albums have a good song or two, but not all of them. Mr. McDougal tells the story behind each album. He lets you put the music in perspective. You follow the path that Dylan went down. He tells some interesting tales. He examines how Bob Dylan and Robert Zimmerman became two different people, how Dylan and his people fashioned a public persona and kept control of what was known about his private life. They controlled the media. If an interviewer broached a subject that Dylan didn’t want to talk about, he got the look and if he continued along that line, then Dylan would just get up and leave. The interview was over, and most likely the interviewer would never get another chance. So this brings up the question, how much of this book is fact? Has this biography been shaped by Dylan and his people? Much of this book draws on other references, but since they may be suspect, who can ever really know. So this book was a moderately interesting story, maybe fiction mixed in with the fact. It gives a new way of looking at all the Dylan books out there, and throws them all under suspicion. But it still was a fun read for a Dylan fan. It will open up your eyes and make you reexamine what you thought that you knew about Bob Dylan. I give this book 4 Stars out of 5. It was well written and an interesting biography of a famous musician of our time. It shows that Bob Dylan is a poet and a joker, a Jew and a Born-Again Christian, a master story-teller and a songwriter, … But who is Robert Zimmerman? The ultimate biography of the musical icon. A groundbreaking and vibrant look at the music hero to generations, DYLAN: The Biography digs deep into Bob Dylan lore—including subjects Dylan himself left out of Chronicles: Volume One. DYLAN: The Biography focuses on why this beloved artist has touched so many souls—and on how both Dylan and his audience have changed along the way. Bob Dylan is an international bestselling artist, a Pulitzer Prize–winning author, and an Oscar winner for “Things Have Changed.” His career is stronger and more influential than ever. How did this happen, given the road to oblivion he seemed to choose more than two decades ago? What transformed a heroin addict into one of the most astonishing literary and musical icons in American history? At 72 years of age, Dylan’s final act of his career is more intriguing than ever—and classic biographies like Bob Dylan: Behind the Shades and even his own Chronicles: Volume One came too soon to cover this remarkable new chapter in Dylan’s life. Through extensive interviews and conversations with Dylan’s friends, family, sidemen, and fans, Los Angeles Times journalist Dennis McDougal crafts an unprecedented understanding of Dylan and the intricate story behind the myths. Was his romantic life, especially with Sara Dylan, much more complicated than it appears? Was his motorcycle accident a cover for drug rehab? What really happened to Dylan when his career crumbled, and how did he find his way back? To what does he attribute his astonishing success? McDougal’s meticulous research and comprehensive interviews offer a revealing new understanding of these long-standing questions—and of the current chapter Dylan continually writes in his life and career. With the upcoming publication of “Dylan: A Biography” (Turner Publishing, May, 2014), Dennis McDougal has authored a total of eleven books and hundreds of newspaper and magazine articles in a career that has spanned over 40 years. Currently, he is working on “The Acid Chronicles,” a book and documentary film about the renaissance of LSD as a powerful tool in the treatment of mental illness. Before he began covering movies and media for the Los Angeles Times in 1983 and, more recently, the New York Times, McDougal worked as a staff writer at dailies in Riverside and Long Beach, California. A UCLA graduate, McDougal holds a Bachelor’s in English and a Master’s in Journalism. He was awarded a John S. Knight Fellowship at Stanford University and spent a year teaching and studying in Palo Alto, Japan and Canada. Over the years, his journalism has won over 50 honors, including the National Headliners and George Peabody Award. He was a producer for CNN during the O.J. Simpson murder trial and co-produced “Inventing L.A.: The Chandlers and Their Times” (2009) for PBS. A contributing writer with TV Guide, McDougal has also written for Los Angeles Magazine, Premiere, and the Los Angeles Times Sunday Magazine. McDougal has lectured in journalism and creative writing at UCLA, Stanford, and the California State Universities at Fullerton and Long Beach. He and his wife, Sharon, live near Memphis, Tennessee, have five children, and 14 grandchildren. This large coffee-table sized book comes with 2 CDs of music included inside the back cover. There are 27 songs, one from each of the artists covered in this volume. Most of the stories of the artists can be read in the time that their song is playing, just keep the remote handy so that you can pause once in a while. I often play the music for an artist when I am reading a book about him. When I was reading the biography of the early Beatles, Tune In: The Beatles: All These Years , I had to purchase a lot of music that was mentioned, just so that I had a real feel for the book. This book does that for you. You get to connect an artist with his work. What a concept! I didn’t know that this book is targeted to young readers when I read it. I didn’t feel like the authors were talking down to me. They use a lot of fun graphic and font elements in the thumbnail biographies of the artists. Looking back, I can see that it would work for middle school students. If you had younger children, you could listen to the music and read this book with them also. This would give them a feel for the music that you listened to and enjoyed. Maybe you could find an artist or two that you both liked. I really enjoyed listening and reading this book. The authors knew what they were talking about. It was just a fun couple of hours. I give this book 5 Stars out of 5 and a Big Thumbs Up! If you like music of the Twentieth Century, and aren’t too hung-up on just one genre, then I think you will enjoy this too. If you have kids that are getting into rock, rap or pop, and you want to connect with them musically, give this a shot. Who knows, it might bring you closer. Exclusive insights from a celebrated musician and passionate industry insiders, two accompanying CDs of legendary tracks and beautiful packaging make for a book with broad appeal — one that will captivate fans of Robbie Robertson and music lovers of all ages. Music industry veterans Robbie Robertson, Jim Guerinot, Jared Levine, and Sebastian Robertson invite young readers to share with them in celebrating twenty-seven musical legends. Short profiles chronicle personal stories and achievements of extraordinarily talented artists whose innovations changed the landscape of music for generations to come. Carefully compiled like any great playlist, the line-up features originators, rebels, and risk-takers across diverse genres. From Ray Charles to Johnny Cash, Chuck Berry to Bob Dylan, Robertson shares anecdotes about these artists and the influence they had on his own musical journey. Always respectful of their reader, the writers never shy away from speaking about the difficult challenges these recording artists faced and the very human foibles that sometimes led to their tragic end. Most of all, it’s the authors’ passion and insights into these personal stories of creativity and collaboration — and the power of music to shine a light on injustice and foster change — that will fascinate, enlighten, and inspire music fans of all ages.”Exclusive insights from a celebrated musician and passionate industry insiders, two accompanying CDs of legendary tracks and beautiful packaging make for a book with broad appeal — one that will captivate fans of Robbie Robertson and music lovers of all ages.